Hillary Clinton has fully proven that her prowess for campaigning is nothing to scoff at; she's sent her dogs sniffing for nay-sayers on the internet, continually drawn attention to her history of delivering aid to those in need (disabled, children, military), and has stood on the opposing side of mainstream ideals (LGBT and women's rights). For all the times Clinton has been made out to look like a wolf in sheep's clothing, there are quite a few things she's done right. And she's just taken full advantage of her successes in a new ad campaign. Released on Clinton's Facebook, Twitter, and Instagram, the ad features no audio. Strange, until you think back; when was the last time you unmuted or even remotely paid attention to an ad whilst in pursuit of the latest cat posts? 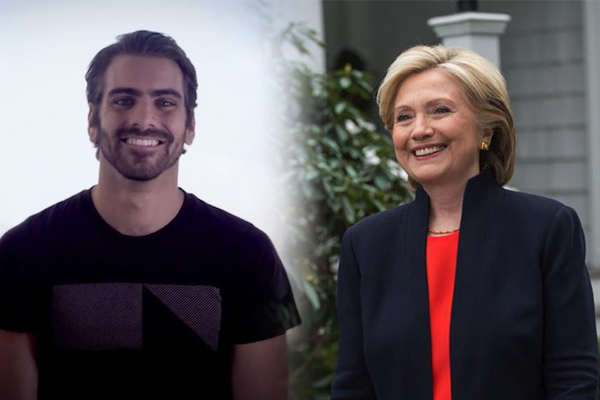 Clinton has enlisted the help of Dancing With the Stars champion and America's Top Model winner Nyle DiMarco. The 27-year-old talent is deaf and communicates using sign language. As such, the silent ad features DiMarco signing a simple, clear message: "Among the 50 million Americans living with a disability, many don't have the ability to work, to travel, or to do countless other things you might take for granted. So this November, please consider voting for the only candidate with a plan to change that. Because the voice of your vote is the greatest voice we have." At the end of the 51-second ad, DiMarco throws a cheeky kiss to the audience and the subtitles oblige with a kissing emoji. It's worth waiting till the end just to see his unabashed smile. There's not much that can stand against this empowered and determined woman. A major campaigning point for Clinton is Americans with Disabilities Acts (ADA) which aims to grant disabled people all the privileges that able-bodied people do, such as education and job opportunities, transportation, and, though this should be granted in this day-and-age, the ability to enter any building. By utilizing autoplay, the ad conveys a pointed message about the stigma towards disabled Americans. Funnily enough, DiMarco throws in a quick bash on Republican candidate Donald Trump during his speech at the Human Rights Campaign's national dinner.